FEATURED TODAY ~ 15% OFF! ~ $233.75 (was $275). 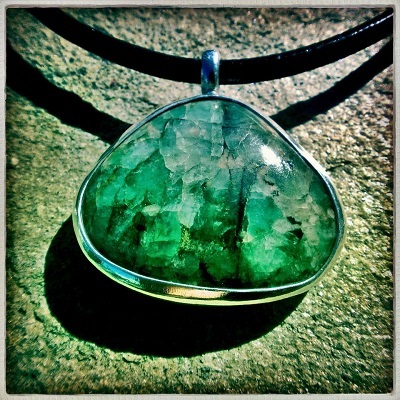 Natural North Carolina emerald and fine silver pendant. House cut, polished and set. The emerald is among the most precious gemstones in the world. It shares its high standing with the diamond, ruby and sapphire. Indeed, the emerald has been highly regarded by the dignitaries of history for centuries. The oldest known deposits are located near the Red Sea of Egypt. These were relatively promptly depleted by pharaohs by 1500 B.C., well before modern archeologists ever set foot in the mines. Prior to the 16th century, emeralds were mined in great abundance in India, Egypt and various regions of Africa. Columbia is by far the top producer on this side of the Atlantic. 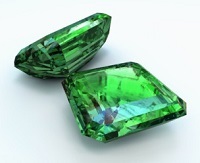 Emeralds are mined in North America as well, notably in the Carolinas, Montana, Nevada and Connecticut. Trace amounts of vanadium and chromium are responsible for the emerald’s rich, green color. For gemologists, color and clarity are the emerald’s most revealing attributes. These are the criteria by which the value of an emerald is established. The finest emerald will display the most verdant green along with high transparency. The emerald is the birthstone for the month of May. In many cultures, it is a symbol of renewal and hope. It is associated with Aphrodite’s Roman counterpart, Venus, the goddess of love, fertility and prosperity.